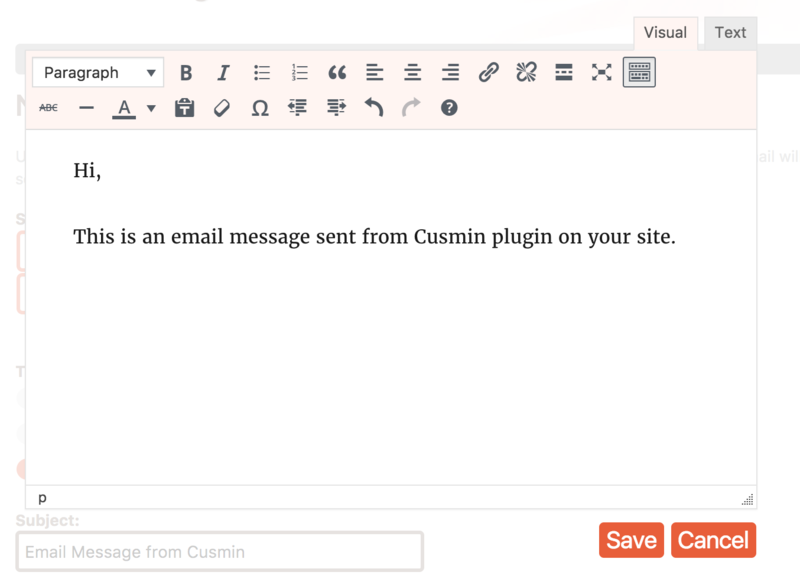 This Cusmin feature can be useful if you have multiple users or subscribers that are using your site, and you want to keep them informed about the latest news and information that could be helpful for them. In the first drop-down field, you can choose to send a notification to a group of users choosing Group (WordPress groups) or individual users, choosing User option. The second drop-down field contains related values, so if the Group is selected in the first drop-down field it will show all WordPress groups, and if User option is selected in the first field, the second drop-down will show all users on the site. 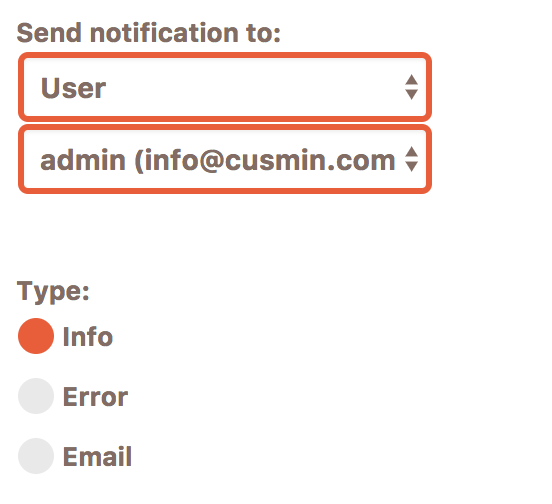 You can choose a type of your notification that could be Info, Error or Email. Email type is available only for individually selected users. 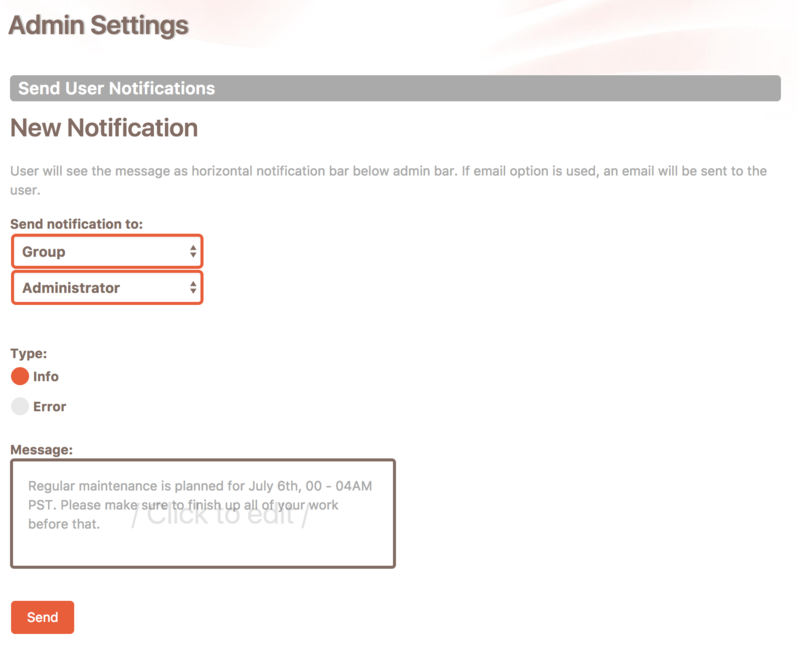 In an example above, we choose to send Info notification to WordPress Administrators. Click on the message box to add your custom message. Fully functional WYSIWYG editor will help you to style and format your message exactly how you want. Click Send to send the message. You will get the message that your notification is successfully sent. The next time your admin users log in to the site or refresh the admin page (if they are already logged in), they will see a new notification. You can also choose to send a notification as an email. This feature will work only if outgoing email configuration is correctly set on your server. Email notifications can be sent only to individual users, so in case that you choose Group instead of User, this option will not be available. Click Send to send the notification. You should get a confirmation message to confirm that email was sent successfully. Viewed by - once your user sees the notification and clicks on the close button, it will appear in this column. 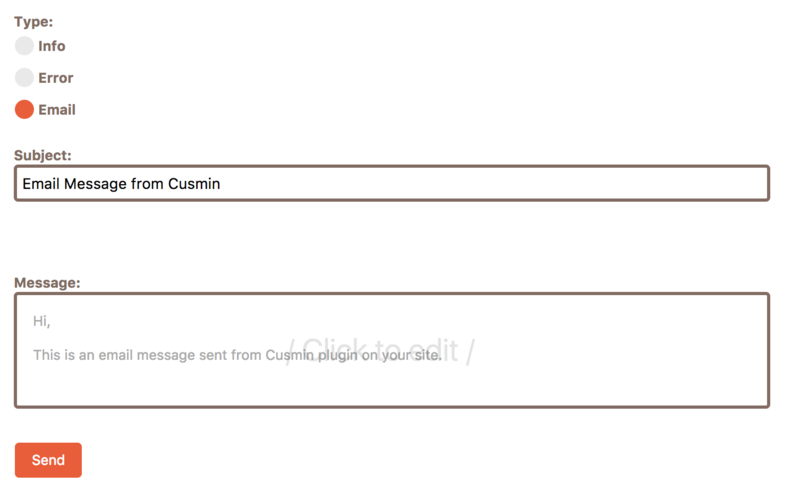 In this example, admin user has closed the message, so it appears in this column. Action - Delete - if you click on Delete button, the notification sent to all users will be completely removed and no user will see it.